Baaaaaaa-ba Yaga has a house with chicken legs and feet! lest a clever girl comes to save theeeemmmm! Baaaaaaa-ba Yaga likes to trick and treat with frog's eyeballs. of the girls to be her protégées! "Ha! My tasty little treats!" "Save us, oh save us, from Baaaa-ba, Baba Yaga, the Witch!" I have no idea why I felt like bursting into song. This book did not make me very happy. It was, not to put too fine a point on it, a disappointment. So perhaps all this singing is to cheer myself up. Or perhaps it's just that "Baba Yaga" fits the rhythm of "Oklahoma!" so well. 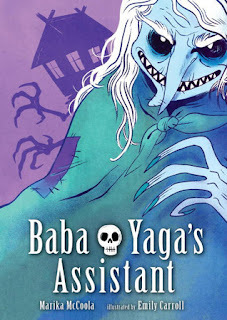 I thought that Baba Yaga's Assistant by Marika McCoola, with artwork by the fantastic Emily Carroll, would be more subversive than it actually is. The idea of Baba Yaga advertising in the newspaper for a new assistant is cute, but she could find some really interesting folks had she gone on Craigslist. A teenage girl named Masha sees the ad and considers it, since her grandmother had also had an encounter with Baba Yaga as a young girl. Plus, the arrival of a new stepmom (Jenny) and a thoroughly wicked stepsister (Danielle), combined with her father's utter cluelessness makes working for a witch pretty tempting. The main problem with this book is that the story is all. Over. The place. So are the characters. Sometimes I think that Masha is maybe 14, but she somehow has very detailed knowledge of all the Baba Yaga stories and how to pass each of the tests with a cool head. Emotionally, she runs the gamut. McCoola tried to make Masha's relationship with her grandmother the center of the story, but it never felt grounded. Masha just accepts that her grandmother actually met a figure from Russian folklore and therefore feels that becoming Baba Yaga's new apprentice would be ... a good idea? Once she finally meets the witch, there are all these tests that she has to pass. Okay, that's a narrative, albeit not a particularly fresh one. Suddenly, Baba Yaga shows up with three kids and says, "Hey, slave-assistant-person, cook these up for me," and horror! The nasty, bitey stepsister is one of the three. I'm pretty sure she bites Masha again. What is up with all the biting? I started to think that maybe Danielle was rabid or something the way she chomped away on people. All of her behavior is pretty much the worst you can imagine when you've got an eight year old kid, because obviously the stepsister has to be evil. You can probably guess the resolution of the story, but Danielle's reformation was too sudden to be believable. I'm really glad that Masha decided to keep her job because I'm pretty sure that little piranha would start plotting new ways to bite her after about a week. Also, Masha's dad is pretty awful: he's been lying to his daughter about eating dinner alone in his office because he's been sneaking over to his fiancée's and dining with her and Danielle instead. It's not too often that your life is better off with a witch who rides around in a mortar and pestle and possibly likes the taste of children, but in Masha's case, it's the best she's got. Emily Carroll's art is, as always, fantastic. There are such lovely details in the panels to denote flashbacks or time shifts. However, she can't be expected to carry the narrative on artwork. I actually think that had Carroll written the text as well, things would have been a lot smoother. Probably a lot bloodier, too, but that comes with the territory. Due to the clunkiness of the story, I can't recommend this, but I'd definitely point older readers toward Carroll's other work. And I'm pretty sure there have been some fun Baba Yaga retellings in at least one of Ellen Datlow's well-curated collection of YA anthologies. Choose one of those instead. Baba Yaga doesn't really belong in our world, I think. She's not just some old witch! Mind you, there was a wonderful short story by Juliet Marillier, based on Vassilisa the Wise, set in a huge block of flats in which Baba Yaga solves the girl's problem - a REAL problem, much nastier than hating your stepsister. And Orson Scott Card wrote a very silly novel in which a young man wakes Sleeping Beauty in a Ukrainian forest, where she has been placed by Baba Yaga, and she follows them back to America, taking over an entire jet and thoroughly enjoying the modern world - who needs a mortar and pestle or a hut in chicken feet when you can fly by plane? When I was about six, we lived in a Victorian worker's cottage with a backyard privy. My sister would want to go at night time and our mother would say, "Wooo, Baba Yaga!" and terrify her. Neither of them remembers it, but it's an interesting thing that this is what Mum would use to scare her little girl. Ooooh, I love Vassilisa stories. Must find that Marillier. I'm pretty sure there's a Vassilisa retelling coming out in YA novels soonish but it's all on my giant spreadsheet of doom for ordering. Yeah, trying to shoehorn the very Western European BAD STEPSISTER subplot into Baba Yaga didn't work very well. I giggled at your mum scaring your sister. Apologies to all scared children everywhere. The Juliet Marillier story was published in a small press collection of her short stories. Can't recall the title just now, but you should be able to find it on iBooks if you type in her name. Juliet M does great stuff with folk tales, whether in novels or short fiction. I attended a workshop of hers on fairytales at a con once - fabulous!